This is a good news — bad news situation. The Grantchester TV show has been renewed for a fourth season on PBS, however, season four will be James Norton’s final outing as Anglican priest Vicar Sidney Chambers. Norton is in high demand, these days. He also stars as Alex Godman on McMafia, an AMC–BBC One co-production that centers on a Russian mob family living in exile in London. Grantchester, season four, will premiere on PBS in 2019 at a date TBD. An ITV and PBS Masterpiece mystery, Grantchester also stars Robson Green as DI Geordie Keating, Sidney Chambers’ partner-in-crime-fighting. Co-stars Al Weaver, Tessa Peake-Jones, and Kacey Ainsworth are also returning for Grantchester season four. Meanwhile, the production will be casting for a new vicar to team up with Keating, to keep 1950s Cambridgeshire safe from the criminal element. Check out this PBS press release to learn more about the Grantchester season four renewal. April 12, 2018—Good news for Grantchester fans: MASTERPIECE on PBS and ITV have announced a fourth season of the popular mystery series starring James Norton and Robson Green as the unlikely clergyman/cop duo fighting crime in the English hamlet of Grantchester in the 1950s. These will be the final episodes for Norton’s character Sidney Chambers, the charismatic, jazz-loving vicar who has captured the hearts of millions of viewers. Casting of a new vicar will be announced at a later date. In addition to Mr. Green, returning members of Grantchester’s ensemble cast include Al Weaver, Tessa Peake-Jones and Kacey Ainsworth. Almost 11 million U.S. viewers tuned in to Grantchester’s third season to watch Sidney choosing between Amanda (Morven Christie) and the church; Detective Geordie Keating (Green) working to repair his tattered marriage; Mrs. Maguire (Peake-Jones) becoming Mrs. Chapman, and Leonard (Weaver) on the verge of finding love. MASTERPIECE has commissioned Grantchester’s fourth season, which begins production in June in London, Cambridge, and Grantchester. It will air on MASTERPIECE on PBS in 2019. What do you think? Are you a fan of the Grantchester TV series? Do you plan to tune in for the fourth season? Do you think the show will work with a new vicar? Sound off, in the comments. 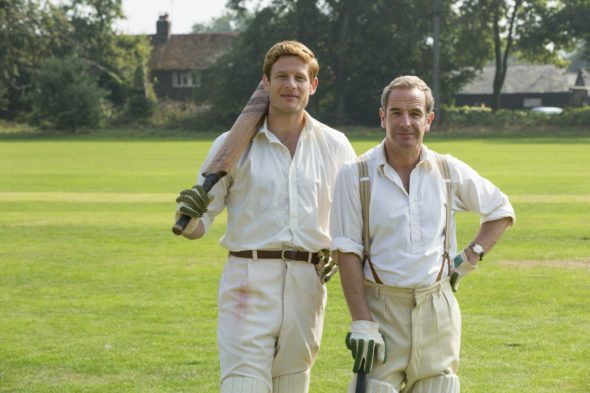 More about: Grantchester, Grantchester: canceled or renewed?, Grantchester: ratings, ITV TV shows: canceled or renewed?, PBS TV shows: canceled or renewed? Looking forward to the return, love this series. Might be hard to say goodbye to Sidney, but I think the series is strong enough it can successfully move forward. Wonderful!. I am so glad! I do think the show can work with a new vicar. James was great. Good luck. I have been waiting and waiting! Thank you! I am so glad there is going to be a fourth season of grantchester. I look forward to grantchester every week and I think James is such a main character that it’s going to be awfully hard to replace him. I hope they can I enjoy the others, but James is the glue. I have love, love loved Grantchester from the first Episode and have watched them at least two or three times. Can’t wait for Season 4. I will miss James Norton, but have been a fan of Robson Green since RECKLESS. Thank you, PBS for bringing a real winner back. This show and the casting is absolutely brilliant, captivating and enspiring. We need more show with a moral compass and humanitarian values. I love the relationships and development of story lines that make this masterpiece gem really intriguing and inspiring to all of us whom are fans. Thank you for the wonderful seasons thus far and hoping for many more to come. In re-casting for Sidney’s role I hope you find an actor that is as dynamic and brilliant as James Norton has been, they will be very tough shoes to follow in. Can the show continue without James Norton? It will be interesting to see who replaces him. I was wondering if there would even be a season 4. Robert Taylor and interesting thought !!! Robert Taylor (Longmire) played a priest on “Ballykissangel”. He’s be perfect to replace Norton. I enjoy Grantchester and the opposite natures of Sidney and Geordie. I hope that the next vicar ‘s character will mesh with Geordie’s as well as Sidney’s has.